After struggling in his first start of the season, sophomore starting pitcher Jonathan King got back on track last Friday in a 7-3 Tech victory over UNC Greensboro. King pitched five innings of shutout ball, allowing only one hit, while walking one batter and striking out two. After giving up a leadoff single to UNC Greensboro’s Nin Marrero to start the game, King retired ten straight Spartans before hitting first baseman Julian Abreu with a pitch in the bottom of the fourth. King’s toughest inning of the night was the fifth, when two Spartans reached base with only one out. King escaped the inning after getting the next two batters to ground out, but Coach Hall still made the pitching change going into the sixth. “I felt fine. Even after that inning I was fine to go another one. I understood completely with the pitch count wanting to make a change, but I just had a patch where I lost a little focus, I guess. Just didn’t finishing pitches, and wasn’t pulling down enough,” King said. In his first start of the season, Tech’s season opener against Old Dominion, King only pitched four innings while giving up three earned runs and five hits. Although King struggled, Tech still won the game 6-5 and King was given the no decision. “He did better, much better. I felt like he had more behind his pitches and he did a nice job,” said Tech Head Coach Danny Hall. 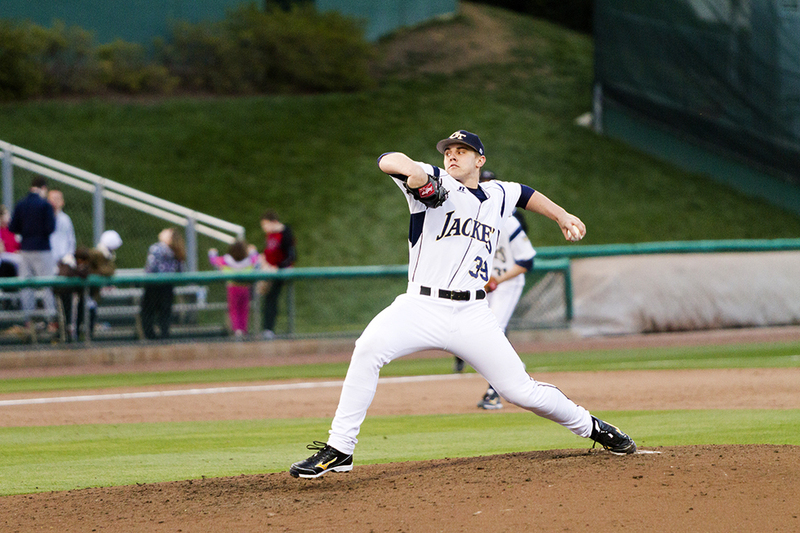 King began last season primarily as a midweek starter for the Jackets, but by the end of the season he was part of the weekend rotation. He went 6-5 in 24 appearances during his freshman season, posting a 4.04 ERA and striking out 52 opposing batters. King made ten starts last season, his first five coming midweek and his last five coming on the weekend. King really started to come along in his last three starts of his freshman season. In starts against Miami, Virginia Tech and Illinois, King pitched a combined 18.1 innings, six each against Miami and Illinois and 6.1 against Virginia Tech and allowed just five earned runs. This season, King is replacing former Tech pitcher Buck Farmer as Tech’s Friday starter, who was drafted by the Royals. “It’s a little different, but I just try to go out there and throw a lot of strikes and let the defense work. I try to keep us in the game because I know if I keep us in the game long enough, we can put up a lot of runs. I knew we were going to score a lot of runs; we’re a good swinging team. The main focus is always just to keep the ball down and let the defense work,” King said. If King struggled with anything in his start against UNC Greensboro, it was his control. Of the four batters to reach base for the Spartans, two reached after being hit by the pitch. Julian Abreu and Aaron Wright were the two Spartans hit. Both are left handed batters and both were hit in the back by the pitch. “They were both just curveballs that got away from me. It just kind of slipped out of my hand, and I just didn’t bend my back when I let go of it, and then it went right into their back,” King said.